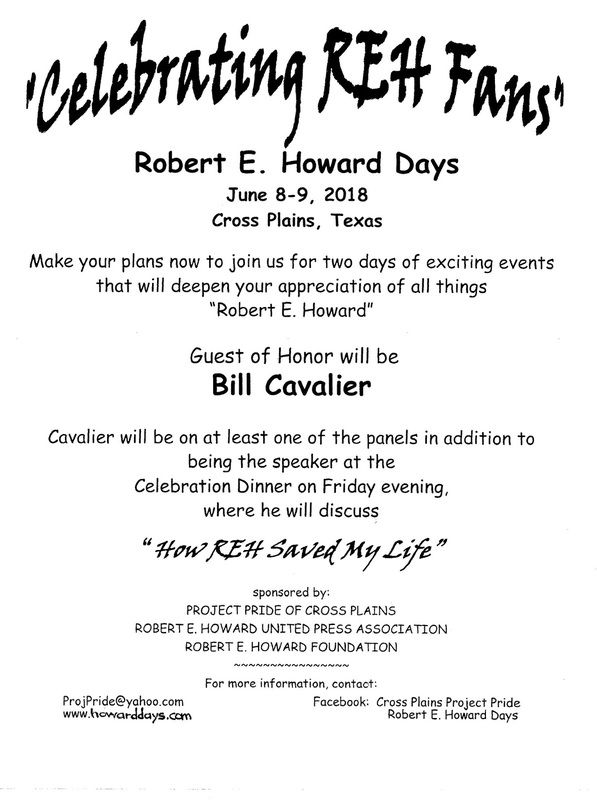 Robert E. Howard Days: TEN WEEKS TO HOWARD DAYS! TEN WEEKS TO HOWARD DAYS! 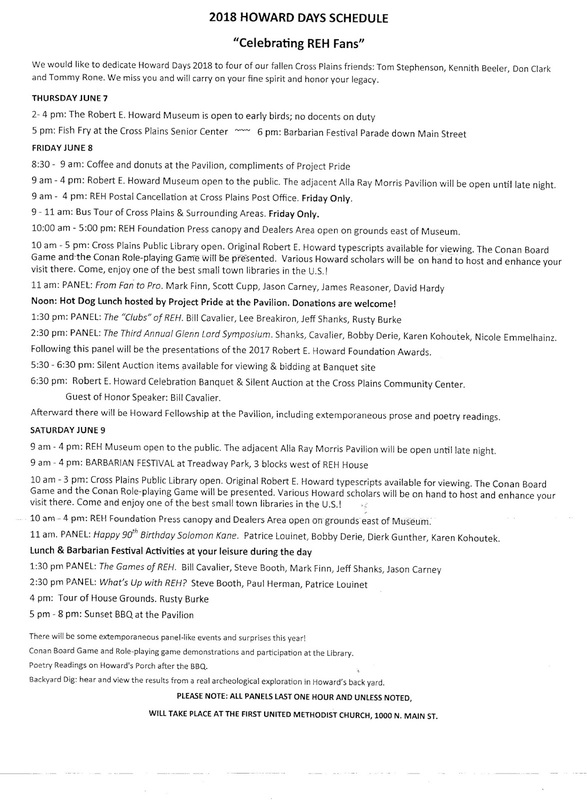 With only ten weeks to go, plans for Howard Days are moving forward! Here is the registration form as sent out by Project Pride. If one has not appeared in a mail box near you, never fear! 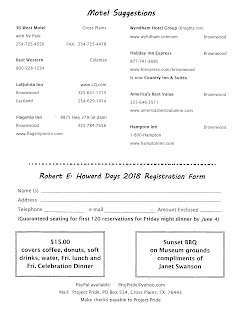 Use this one to register for the Friday night Celebration Banquet and help out with other costs. Now, you don't have to "register" to attend Howard Days, you know. All of the activities connected with our annual gathering are presented at no cost: Tours of the House and grounds, the Bus Tour, all the panels and readings and accessibility to the adjoining Pavilion - FREE! 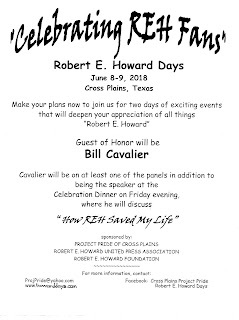 Just show up and enjoy the events and the fellowship of Robert E. Howard Fans from all over the world. 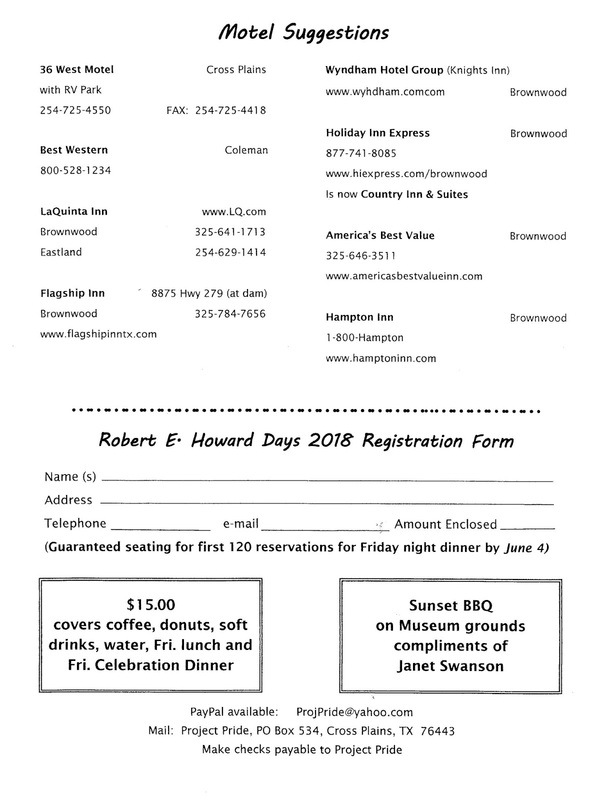 The registration fee is to insure that you have a seat at the Banquet, which is limited to 120; also, it helps defray costs for the Friday lunch, drinks - and cake! Did we mention the cake? At the Friday Hot Dog Luncheon, we'll have cake to help celebrate the 90th birthday of one of Howard's more famous characters, Solomon Kane. There will be a knife to cut the cake, so leave your rapiers at home! 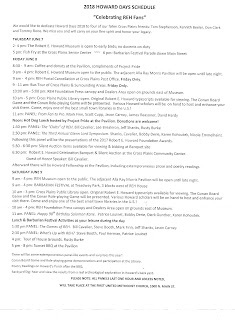 For more detailed information about Howard Days, just click on the handy tabs on this page for answers to your questions. There's a contact name there too, if you need even more specific answers. Stay tuned to this page and our Facebook page as we ramp up our coverage of the premier event in Howard Fandom! We want to make Howard Days as enjoyable an experience as possible for all of you as we "Celebrate REH Fans" at our 2018 event! Looking forward to seeing y'all.